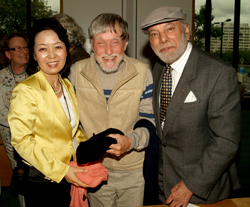 Ambassador for Peace Dr Carl Shapley, (Carlo), passed away. His funeral was held in Moldova on August 17th at 14.00 British Summer Time. For an insight into his life please see this interview about Albert Einstein (Link) and the Defining Moment interview by Ajay Rai. He has been a longtime supporter of UPF and preceding organisations with the uncanny ability of turning up in the UK at the right times to support our major activities. 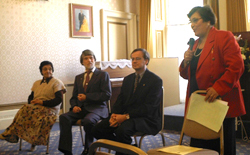 New Families for a New Millennium conference photo of Dr Carl Shapley (2nd from left) on right on June 1st 2000.